This box was painted by a talented Palekh artist Shemarov Alexander. 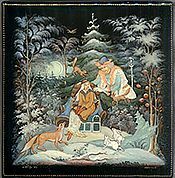 The box shows a scene from Russian fairy-tale "Morozko" or "Father Frost". It tells about a little girl who was sent to the forest on a bitterly cold night by her cruel stepmother. The stepmother intends to kill the girl because she is more beautiful and hardworking than her own daughter. The end of the tale is happy; the girl is rewarded while her stepmother and stepsister are punished. On this composition we can see a girl in the winter forest, sit on the chest full of treasures, that a girl was awarded. Father Frost is kindly putting on a coat on her shouldres. We can see forest animals near by: sqiurrels, fox and bunnies. The work is a good example of intricate Palekh art. The green colors become electric, the reds and whites passionate. Hair thin gold and silver accents have been used extensively throughout the composition adding rich luminescence and delicacy to the piece! Composition is framed with golden dot ornament, the box's sides are decorated with intricate gold and aluminum leafy pattern. The box is constructed from paper-mache. Black lacquer is used to paint the exterior of the piece while red lacquer completes the interior of the work. The lid is hinged from the top of the composition, and the box rests flat. The artist wrote the name, the village name of Palekh and 2018 along the bottom of the composition in gold paint.